Bloodstream infections with the hospital superbug MRSA must be halved in three years, the government has said. Health Secretary John Reid tasked NHS hospitals with achieving a year on year reduction up to and beyond March 2008. But official rates show year on year increases in England since measurement began in 2001. Critics said more resources would be needed to meet the ambitious target. To meet these expectations there will be a need to increase resources. The National Audit Office estimates infections such as MRSA (methicillin resistant Staphylococcus aureus) kill 5,000 people each year. 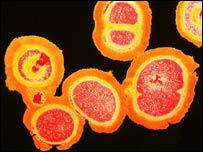 Between April 2003 and March 2004 MRSA blood infections increased by 3.6% from 7,384 to 7,647. But the NAO says incomplete data means the crisis cannot be accurately assessed and the true figure could be much higher. Some of the highest rates were in the country's most prestigious specialist hospitals. In July, Mr Reid introduced a number of measures to tackle MRSA. Trusts now have to meet national standards, and be inspected to see how successful they are in reducing hospital acquired infection rates. Those judged to be performing poorly on cleanliness have to provide an action plan for improvement within three weeks, followed up by a re-inspection within six weeks. Matrons have been given direct responsibility for cleaning staff, and ensuring patients' views are taken on board. Halving a problem, when you don't really know the scale of the problem, is an extraordinary feat. New patient bedside phones are being introduced that include speed dial buttons to alert staff to the need to deal with a hygiene problem. There will also be a summit involving the world's leading infection control experts to discuss how best to tackle the problem. Mr Reed told the Chief Nursing Officer's conference in Manchester on Friday that although it would be challenging, the target was "achievable, measurable and not too burdensome and will drive in its wake other sites of MRSA infection." He said: "I expect MRSA bloodstream infection rates to be halved in our hospitals by 2008. "NHS Acute Trusts will be tasked with achieving a year on year reduction up to and beyond March 2008. "All trusts will have to identify high-risk sources of infection and draw up comprehensive action plans to prevent or isolate MRSA in order to achieve this reduction. "Everyone has a role to play - hospital cleaners are as important as consultants when it comes to these issues." But Dr Paul Grime from the British Medical Association questioned whether the target was achievable. He said: "I think it would be very difficult to predict on the evidence so far. "There's been a year on year increase of MRSA blood stream infections reported. "The NAO report showed despite all the initiatives that have been taken in the last few years there is still a lack of reliable information to measure progress and there didn't seem to be any demonstrable improvement." He said a number of issues needed to be addressed, including cleaning contracts, hand hygiene, antibiotic use and bed occupancy rates. Jean Lawrence of the Infection Control Nurses Association said: "We have not been consulted in regards to this ambitious and challenging target. "We look forward to talking to John Reid about the proposals being put forward. "To meet these expectations there will be a need to increase resources to infection control teams, including instigating a comprehensive national surveillance programme and empowerment of infection control nurses to do their job." Dr Mark Enright, Royal Society Research Fellow in the Department of Biology and Biochemistry at the University of Bath, said there was no evidence base that shows that better hygiene would reduce local or national MRSA rates. Conservative Shadow Health Secretary Andrew Lansley said: "Whitehall targets have been a key cause in the proliferation of MRSA since 1997, and here we see the government setting another target. "As MRSA has doubled since 1997, halving it would bring us back to where we began. "This target is nothing but all talk and it will achieve little to combat the wider issue of hospital-acquired infections." Lib Dem Shadow Health Secretary Paul Burstow said: "Halving a problem, when you don't really know the scale of the problem, is an extraordinary feat. "Until the government own up to the fact that they still do not know the true level of hospital infections and take the steps to find out, patients should take this announcement with a pinch of salt." The Healthcare Commission said it would carry out reviews on cleanliness and hospital acquired infection with a view to identifying good practice and driving improvement where there is still more work to be done. At the same conference on Thursday, the new Chief Nursing Officer Chris Beasley announced more than a million NHS staff will receive infection control training to help fight MRSA.